If coconut doesn’t bring you out of a winter rut, how about mango? Mango cupcakes with a mango coconut oil buttercream frosting, anyone? February is a busy month for me and Rob. Valentine’s Day, followed by Rob’s birthday and also our anniversary. We tend to go all out for Rob’s birthday, but this year, we kept it simple by meeting with friends at Rob’s favourite resto in our neighbourhood. No jackfruit “pulled pork” wraps or pineapple and cucumber guacamole this year. While The Beet has possibly my favourite desserts in the city (the best raw cheesecakes), I couldn’t pass up the opportunity to make Rob a birthday treat. The trick? Keeping it a surprise. I made the cupcakes the night before, as Rob was out late for a work gathering. I had an hour before he came home so I whipped together the cupcakes. No baking expert at all, I called my mom to ask how long I had to let the cupcakes cool before I could frost them. At least half an hour, she told me. How long have they been out of the oven? Uh, I still have 15 minutes left in the oven and he’s due back in 45 minutes. She laughed. No frosting tonight. I hid the cupcakes.. and ran the dishwasher with all the dirty dishes. So that’s my rambly preamble…. but I should not be keeping you in suspense because these cupcakes were winners. We shunned the desserts at the resto in lieu of cupcakes. Not just any cupcakes. Mango cupcakes with a mango buttercream frosting. Booyah! Vegan cupcakes, of course. Whole wheat, no problem (actually you wouldn’t know it, unlike my chocolate avocado cake). 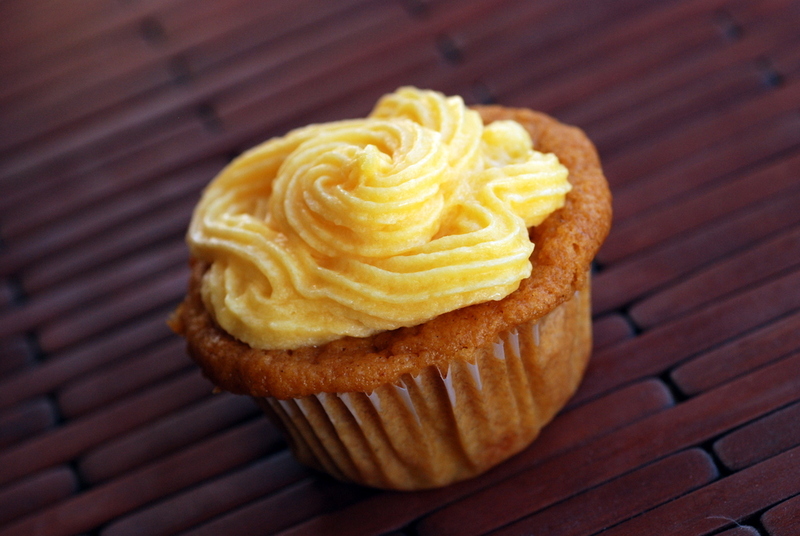 Mango cupcakes sound revolutionary but it isn’t unusual to substitute apple or banana into baked goods. Here, I used mango puree. You could blend your own, or pick up a can of puree of Alphonso mangoes (the sweetest King of Mangoes) to make them moist and sweet. The cupcake base is also spiced with cardamom for an Indian twist. For the frosting, I will admit that I cracked and bought some icing sugar (everything else was from our pantry, including the mango puree). I contemplated making my own icing sugar from coconut sugar but decided against it at the last moment. My substitutions were mainly by using coconut oil. Because if there is one thing that I have a lot of (after beans and kelp noodles), it is coconut oil. Making coconut oil frosting is no new feat, but this was heightened by adding mango puree to it. The solid nature of coconut oil means that you don’t need to add as much icing sugar to achieve a stiff consistency. It was also super easy to pipe. Way easier than when my Mom and I made the royal icing for my bathbomb cupcakes. This is my submission to this month’s Tea Time Treats for cupcakes, to this week’s Healthy Vegan Fridays, to this month’s Credit Crunch Munch and this month’s Bookmarked Recipes. 2. In a large bowl, whisk together the flour, baking powder, baking soda, salt and cardamom powder. 3. In a medium bowl, mix together the mango puree, melted coconut oil, sugar and vanilla. Stir until the sugar is dissolved. 4. Pour the wet ingredients into the dry ingredients and mix until just combined and the lumps are gone. Do not overbeat. 5. Place batter into paper-lined muffin pan (mine filled 12). 6. Bake for 25-27 minutes, or until a toothpick inserted in the center comes out clean. 7. Allow to cool completely before frosting (at least half an hour). 1. With a mixer, using the K-bar, beat coconut oil on high until light and fluffy, around 2 minutes. 2. While the mixer is on low, add the mango puree, vanilla and slowly add in the sugar. Scrape down the sides as needed and whip on high until light and fluffy. 3. Frost the cupcakes after they’ve cooled completely. Be careful of heat after frosting them. Our last cupcake’s frosting melted by the end of the night. Although I wasn’t chaperoning it so I can’t comment on what went wrong. After that giant list of dessert deliciousness I’m going to have to beg you to send me a birthday treat this year! I can dream up imaginary desserts all the time.. making them is another story. 😉 When is your birthday, Laura? Yummy! 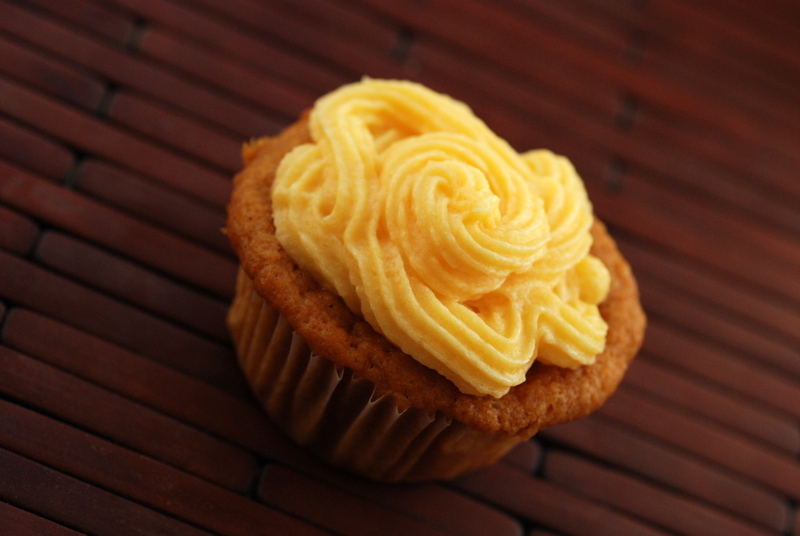 I love the frosting – did you use canned mango puree? Or fresh one? I used canned puree but fresh would work, too! Mango definitely gets me in a tropical kinda mood! These look awesome! Oh my WOW, Janet. I am bookmarking this for when Champagne mangoes come into season and I begin buying them by the case at the Asian market like I am wont to do. These look incredible! You must be secretly Australia. People be obsessed with mangoes down there. Haha, Rob loves Australia and he is definitely the mango-lover between the two of us. Does Australia grow mangoes? We prefer the Indian Alphonso ones during their short-lived season. There are indeed lots of high quality mangoes grown in Australia! I remember some great ones with very little stinginess. Hooray! These cupcakes sound wonderful, flat top notwithstanding. 🙂 Cakes bursting with lots of fruit are my favorite. Never tried mango, though! We’ll have to fix that. I’ll bet they’re as tasty as they are cute! My mouth is watering looking at those! Yummy!! Janet: I could definitely taste the love in the cupcakes! It’s the best seasoning! Hannah: although I enjoyed the mango in Australia it was Thailand that put me over the top! Wow those are soooo pretty and the photography is great 🙂 Rob sure is a lucky guy! Love the idea of mango cupcakes- they sound so summery! Perfect for getting us through this terrible weather. I had to laugh about your issues with timing the baking and frosting. I have experienced that soo many times! I usually end up making desserts in a least 2 stages. Oh I will have to make these for my Rob!! 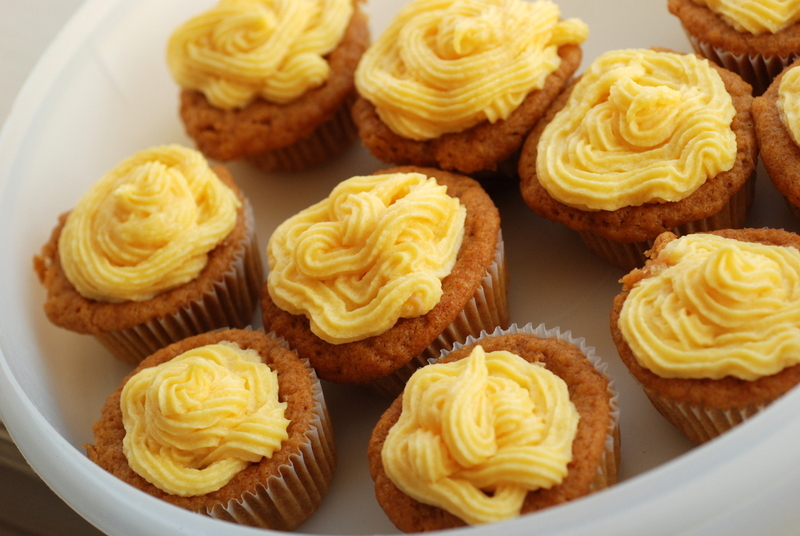 Oh man, I’ve never thought to make mango cupcakes…for shame. And it’s pretty groovy that they’re a little bit healthified! I had no idea you could make such a nice buttercream with coconut oil, though I guess it would be a little more moody about melting than butter. So many kitchen things to try! I have a serious appreciation for any dessert recipe that is made vegan. These sound so delicious and they look so pretty! Thanks for sharing :). Janet, I am so sorry, as I was sure that I had commented on these, but it seems not. I love the idea of these cupcakes, especially the coconut oil frosting. Certainly one to try. Thank you so much for sending to Credit Crunch Munch! Underneath the title, I wrote: Adapted from Holy Cow Vegan and linked to the recipe. This is how I credited the original source and I used the same link you provided. Since I rewrote the directions and credited the source, I trust that is ok?